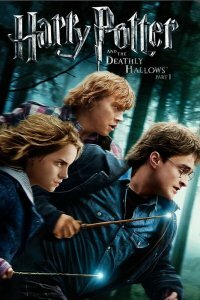 Harry Potter and the Deathly Hallows Part 1 is coming to Blu-ray/DVD and On Demand April 15. Bring Daniel Radcliffe, Rupert Grint, Emma Watson and Helena Bonham Carter home, along with a preview of the opening scene of Harry Potter and the Deathly Hallows Part 2 and other fun extras. Harry Potter and the Deathly Hallows Part 1 is coming to your own home theater Friday, April 15 and you get extras, whether you rent it in HD On Demand or buy the Blu-ray/DVD. The two most talked about features from the Harry Potter and the Deathly Hallows Part 1 Blu-ray, DVD and digital copy combo pack are the sneak peek of the opening scene of Harry Potter and the Deathly Hallows Part 2, which hits theaters this July, and the WB Maximum Movie Mode, in which Jason Isaacs (Lucius Malfoy) and other members of the cast and crew take viewers on an interactive journey through Deathly Hallows Part 1. Check out the full Blu-ray combo pack features list below. Those who rent Harry Potter and the Deathly Hallows Part 1 On Demand in hi-def through digital cable, satellite TV and select game consoles will have access to bonus content, including “Dan, Rupert and Emma’s running competition,” an exclusive video that gives a glimpse of the new cast members on the set and a deeper look at the making of the soundtrack for Harry Potter and the Deathly Hallows Part 1. The Blu-ray combo pack, featuring a hi-definition, a standard definition and a digital copy of the film, goes for $35.99, while the single disc DVD in widescreen format is $28.98. The single DVD doesn’t seem to include any of the fun extras. Dan, Rupert and Emma’s running competition — While filming the escape scene from the Snatchers in Swinley Forest, Daniel Radcliffe, Rupert Grint and Emma Watson engage in a little competition of their own. With commentary by director David Yates. The Seven Harrys — See how Daniel Radcliffe recreated the personalities of the different characters that transform into Harrys during the escape from Privet Drive. On the Green with Rupert, Tom, Oliver and James — Accompany Rupert Grint, Tom Felton (Draco Malfoy), Oliver Phelps (George Weasley) and James Phelps (Fred Weasley) for a round of golf and get a glimpse into their 10-year friendship that developed while making the Harry Potter films. The Wizarding World of Harry Potter promotional trailer — Join Daniel Radcliffe, Rupert Grint, Emma Watson and other cast members from the Harry Potter films on their first visit to the grand opening of the Wizarding World of Harry Potter in Orlando, Florida.